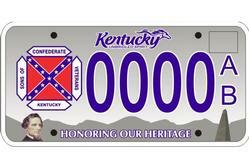 A proposal to create a Confederate heritage license plate caused a big brouhaha in Kentucky last week. It got me to thinking about the way people react to symbols. I have never considered the Confederate flag offensive, or necessarily racist, although I know many people use it in that sense. I have personally known several people who take great pride in their southern heritage and believe strongly in state sovereignty. They have never demonstrated any racist tendencies. On the other hand, I also know some people who find any Confederate symbolism extremely offensive. They tend to assume anybody who displays these symbols MUST somehow harbor racist sentiments. They can’t conceive that the rebel flag could have any other meaning. My initial reaction to those offended by the Confederate flag is to say, “Get over it and quit being silly.” But as I was pondering the issue the other day, it occurred to me that it’s not really fair to dismiss their interpretation of the symbol. Their view of the rebel flag evolved in a negative way due to events in their own lives that shaped their perception. You can’t simply say, “Quit feeling this way,” about something so deeply engrained. It stems as much an emotional reaction as rational, and we all know our emotions don’t always follow reason. But it is equally unfair for those who equate all things Confederate with racism to project that view on somebody else, and then insist that they must harbor racist sentiments, or mean something harmful and negative. The southern heritage folks developed their view of things through very different experiences and sincerely view the symbolism differently. I’m not sure you can call either side “wrong” in what they feel. Symbols aren’t objective. They find their meaning in the way each individual perceives that symbol. For instance, an American flag can stir some to prideful tears and induce blind rage in others. So, how do we deal with the issue? I think it comes down to something often talked about by the left, but not so often demonstrated – tolerance. The problem arises when those who take offense at a given symbol seek to ban it. Really, what does it matter if some guy wants to drive around with a rebel flag on his truck? Why should someone else insist he doesn’t have the right to display a symbol because their own perception offends them? Last I checked we don’t have a right to live free from offense. Heck, even if the driver is a card carrying racist redneck, does it really matter if he has a rebel flag on his car? I like my wife’s take on it. She says let them fly their rebel flags. Then she knows who they are. I’m amazed at the power of media templates. Take Ron Paul, for instance. For years, all I knew about Paul was the media spin, regurgitated through acquaintances - “He’s a nut.” There were always a few sound bites thrown in to demonstrate his nuttiness. But over the last few months, I’ve actually taken the time to LISTEN to what Paul says, in toto, without the media filter. I’ve had to conclude that either I’ve turned into a nut, or he isn’t one. Truth is, most who tag Paul as a nut couldn’t actually tell you three things he legitimately advocates. I was one of those people – and I’m not proud of that fact. Listen and read for yourself. What exactly do you call it when somebody else dictates, by force, how you must dispose of your labor or intellectual efforts?